Please be sure to tune in to WGN this Thursday as the Bloom Township Marching Band will be performing in the Uncle Dan’s Thanksgiving Day Parade in downtown Chicago. We are unit no. 71 and should be on television somewhere between 10-11am. I want to thank everyone for your support, encouragement, and recognition of our band students’ hard work and accomplishments. Thanks to the coaches for being flexible with the field house so we can rehearse. Thank you activity sponsors for flexibility in scheduling so that our students can continue to participate in multiple activities. And thank you to all of the administrators, both building level and district level, for your support, belief in me, and the potential of our students. See you on TV! 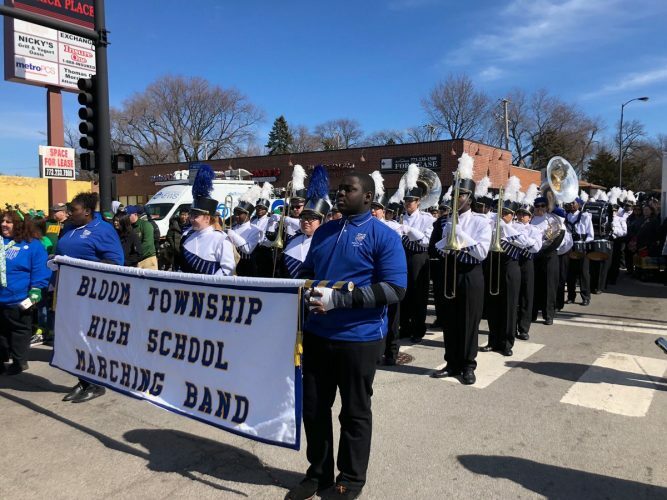 The Bloom Township High School District 206 Marching Band has been accepted to the 2018 Chicago Thanksgiving Day Parade. Chicago’s Grand Holiday Tradition is produced and presented by the Chicago Festival Association (CFA) and held on State Street in Downtown Chicago every Thanksgiving morning from 8:00 AM until 11:00 AM CST. The parade is telecast live on WGN-TV in the Chicago media market and nationwide on the WGN America cable network.